My summer break for 2012/2013 has come to an end, and it will be back to work as usual from Monday. I’ve had a lovely break away from school, spending time with family and friends, reading, getting things done around the house. For me, the school holidays over the last few years have also included doing a bunch of stuff for SLANZA, and this break is no different. The other project that’s taking shape is a new Professional Development programme for SLANZA members, urged on by our survey last year that showed 80% of respondents want PD around the use of online tools in school libraries. It’s a big project, and one that the SLANZA PD team are keen to deliver ASAP. As part of the programme design, we’ve been investigating the use of OpenBadges as a method of recognising and displaying the skills that participants will learn as they progress through the course. 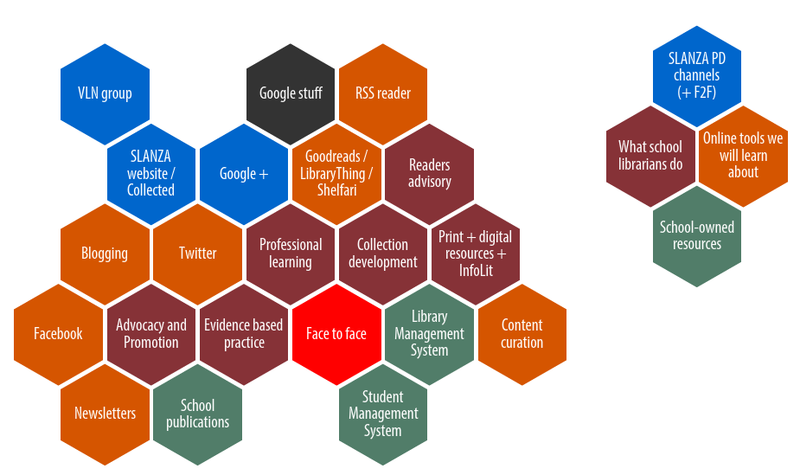 Here’s a diagram I’ve made (using Triptico’s ‘hexagonal thinking’ tool Think Link) to show my thoughts about how this PD might connect with ‘what school librarians do’. I’d love to get your feedback on this, so please leave a comment with any thoughts or suggestions that you think could be incorporated. I tend to get a bit tunnel-vision-y at times, so if there are glaringly obvious omissions please help me fill them in!